Preheat the oven to 200C/400F/Gas 6. Grease the inside of the ramequins with butter and dust with caster sugar. Rub the sugar cube over the skin of the orange to extract the oil, then crush the sugar cube in a bowl. Grate the orange peel to remove the orange zest and set a side the zest for later. Pour JUST MILK into a pan, add the vanilla pod, the crushed sugar cube and the orange zest over a low heat. Bring to the boil, stirring occasionally, then remove from the heat. Leave to cool then remove the vanilla pod. Place the plain flour and the the caster sugar into another pan and add a splash of the cooled vanilla and orange-infused milk. Place over a low heat and gradually stir in the remaining milk infusion, mixing well to avoid lumps. Bring to the boil, then remove from the heat and stir well for a couple of minutes until smooth and thickened. Whisk the egg yolks into the cooled sauce one at a time and add in the Cointreau. Place the egg whites into bowl and whisk until soft peaks form when the whisk is removed. Fold the whisked egg whites into the cooled sauce. Transfer the soufflé mixture to the prepared ramequins. 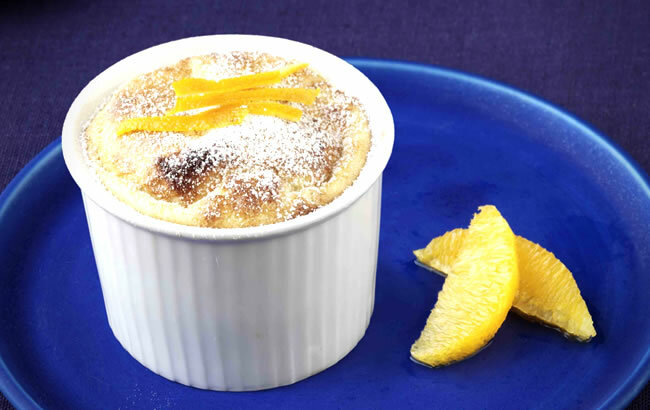 Place the soufflé into the oven to bake for 10-15 minutes. Serve immediately at the table in the ramequins.